After receiving a No. 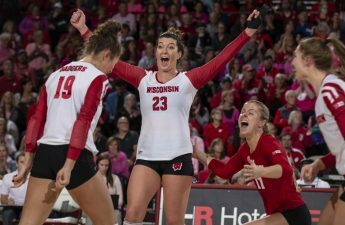 6 seed in the NCAA Women’s Volleyball Tournament, the University of Wisconsin volleyball team had to defend home territory two more times to stay alive in the big dance. The Badgers did so by taking down UW-Green Bay and Pepperdine over the weekend to advance to the Sweet 16. Their first battle came against in-state rival Green Bay Friday night. The Badgers got off to a quick start, jumping to a 10–5 lead before Green Bay called a timeout to think of a way to shut down Dana Rettke and company in the front row. But whatever Green Bay tried to do to disrupt a near-perfect Badger offense didn’t work. The Badgers rolled to a 25–9 opening set win without a hitting error through the set. The Badgers started out the second set cold, dropping the first five points to Green Bay. After a rally, the Badgers reclaimed the lead 7–6. The score would stay close throughout the whole set, but it took a couple extra points for the Badgers to win by two. 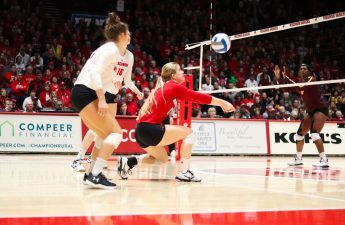 After both defenses caused some long volleys, the second set ended in the Badgers’ favor 27–25. “I liked how our mentality was just kind of staying with it,” head coach Kelly Sheffield said when asked about the team’s response to the second set. The third set went more as Wisconsin had planned as they got off to another great start leading 9–2. Molly Haggerty tacked on three more kills to put her at a match-high 10 kills on the night. With the help of both Haggerty’s offense and defense, Wisconsin opened the tournament with a clean sweep, earning a 25–15 third set victory. Haggerty led the Badgers in both kills, with 10, and digs, with 15. Tiffany Clark also had 15 digs in a defensive battle of liberos. Rettke and Tionna Williams both stuffed five blocks, and Sydney Hilley had 36 assists. The next Badger opponent came Saturday as the Pepperdine Waves, who beat the Northern Iowa Panthers in a four-set battle Friday night, visited Madison. A Clark ace and back-to-back Haggerty kills established an early lead for Wisconsin in the first set. 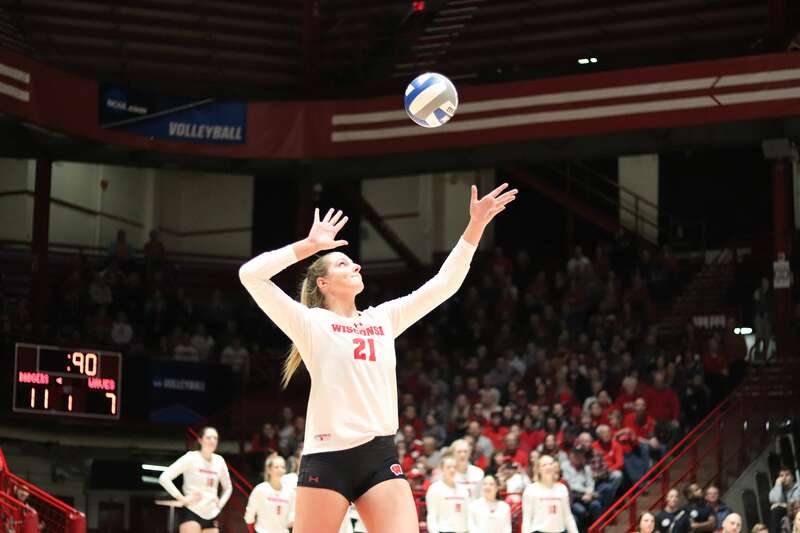 The rally continued for the Badgers with Grace Loberg getting a kill on four of the next six Wisconsin points for a 25–16 set win. The next set was all Badgers and then some. Williams, stepping up in her last home game as a Badger, recorded back-to-back kills to put Wisconsin up 7–4. Thanks to another impressive night from Haggerty, the Badgers cruised to a 25–15 second set win. With their backs against the wall and their season on the line, Pepperdine dug deep and fought with everything they had left. The amazing serving team found their niche as Blossom Sato and Hannah Frohling served an 11–1 rally, helping force a fourth set with a 25–15 third set win. But the Badgers were looking to bounce back on their path to yet another Sweet 16. The team quickly put set three behind them and came back out to dominate in set four. With more great hitting from Loberg and Haggerty, the Badgers packed their bags for the next round with a 25–12 match-winning set. Leading the way for the Badgers was Williams with 14 kills. She received a standing ovation from the Badger crowd as she exited the UW Field House for the last time. “It was just incredible, the amount of support I have had over the four years being here. Going to the Sweet 16 with my teammates again is just incredible,” Williams said. Sydney Hilley had a big night leading in both assists and digs, recording 48 and 19 respectively, and recording six blocks alongside Rettke. The Badgers advance to the Sweet 16 for the sixth year in a row. They will take on the University of San Diego in Illinois Friday at 1:30 p.m. The game will stream online through ESPN3 with live stats at UWBadgers.com.